Last night, my husband and I attended Parent – Teacher night at our kids’ school. We had to divide and conquer because their appointments were at the same time. I went to Natalie’s classroom and Bill went to Liam’s class. When we both got home, I ended up doing a Twitter party for Chapstick and didn’t have time to talk to my husband about it all until this morning. That’s when he showed me this picture — Liam’s signature from his parent letter. Liam’s real name is William – after his father of COURSE. But we NEVER call him William. He’s been Liam since the day he was born. I actually had to give him a heads up on the first day of Kindergarten that his teacher “might call you by a different name”. LOL! 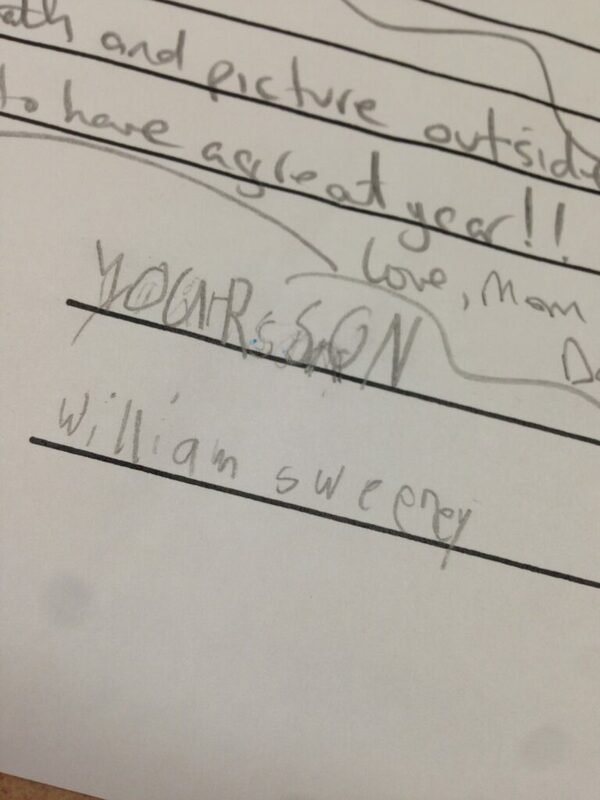 Last year, while in 1st grade, he sort of owned the fact that he had a proper name. Since then, he started using William during important times – times that he believed matters. I guess last night mattered.